Will Make Beats For Food : Apt. 5B Hosted by Kil: Is Jay Z The Anti Christ? Oh Yeah...We Talk About 4:44 Too! Apt. 5B Hosted by Kil: Is Jay Z The Anti Christ? Oh Yeah...We Talk About 4:44 Too! For this week's ep of my podcast, Apt. 5B is a sweat box so with waaaaaaay too many folk to name we're chopping it up about why grown man fall down and worship and follow Jay the way they should be following Jesus Christ. Why grown men would trade in the X5 they LOVED cause Jay said it's the baby momma car, why grown men got rid of all their $450 Mitchell & Ness jerseys cause Jay said so, why grown men will...well, ya'll get the point. 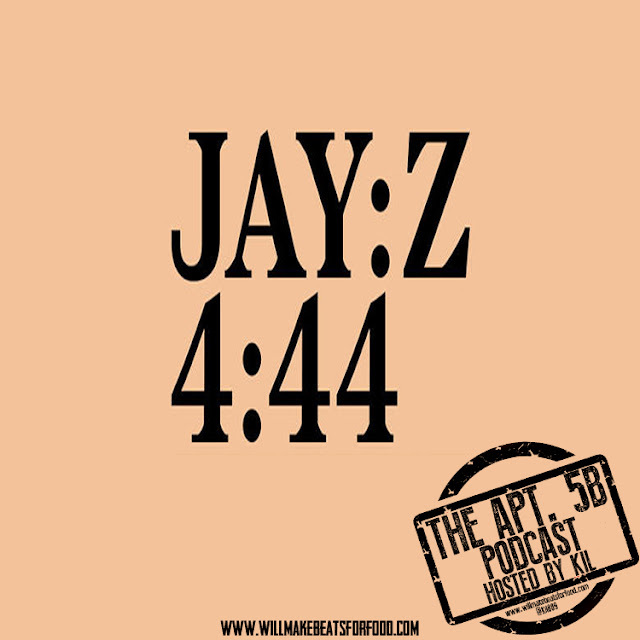 Don't worry cause we finally do get around to chopping it up about "4:44" our likes, dislikes, where it falls in Jay's discography and how many mics it gets. And speaking of mics, we're also chopping it up about how long should an album get before we can call it a classic and do we really need to rate albums in the first place or should we just appreciate them for what they are? Trust and believe this is just ANOTHER dope episode in the clip and don't forget to subscribe to our You Tube Channel!